Whereas great Mischiefs and Inconveniencies have arisen from Clandestine Marriages; for preventing thereof for the future, Be it enabled by the King’s most Excellent Majesty, by and with the Advice and Consent of the Lords Spiritual and Temporal, and Commons, in this present Parliament assembled, and by the Authority of the same, That from and after the twenty-fifth Day of March in the Year of our Lord one thousand seven hundred and fifty-four, all Banns of Matrimony shall be published in an audible manner in the Parish Church, or in some publick Chapel, in which publick Chapel Banns of Matrimony have been usually published, of or belonging to such Parish or Chapelry wherein the Persons to be married shall dwell, according to the Form of Words prescribed by the Rubrick prefixed to the Office of Matrimony in the Book of Common Prayer, upon three Sundays preceding the Solemnization of Marriage, during the Time of Morning Service, or of Evening Service (if there be no Morning Service in such Church or Chapel upon any of those Sundays) immediately after the second Lesson: And whensoever it shall happen that the Persons to be married shall dwell in divers Parishes or Chapelries, the Banns shall in like manner be published in the Church or Chapel belonging to such Parish or Chapelry wherein each of the said Persons shall dwell; and where both or either of the Persons to be married shall dwell in any extraparochial Place, (having no Church or Chapel wherein Banns have been usually published) then the Banns shall in like manner be published in the Parish Church or Chapel belonging to some Parish or Chapelry adjoining to such Extraparochial Place: And where Banns shall be published in any Church or Chapel belonging to any Parish adjoining to such Extraparochial Place, the Parson, Vicar, Minister Curate, publishing such Banns shall, in Writing under his Hand, certify the Publication thereof in such manner as if either of the Persons to be married dwelt in such adjoining Parish; and that all other the Rules prescribed by the said Rubrick concerning the Publication of Banns, and the Solemnization of Matrimony, and not hereby altered, shall be duly observed; and that in all Cases where Banns shall have been published, the Marriage shall be solemnized in one of the Parish Churches or Chapels where such Banns have been published, and in no other Place whatsoever. II. Provided always, and it is hereby further enacted, That no Parson, Vicar, Minister or Curate shall be obliged to publish the Banns of Matrimony between any Persons whatsoever, unless the Persons to be married shall, seven Days at the least before the Time required for the first Publication of such Banns respectively, deliver or cause to be delivered to such Parson vicar, Minister or Curate, a Notice in Writing of their true Christian and Surnames, and of the House or Houses of their respective Abodes within such Parish, Chapelry or Extraparochial Place as aforesaid, and of the Time during which they have dwelt, inhabited or lodged in such House or Houses respectively. III. 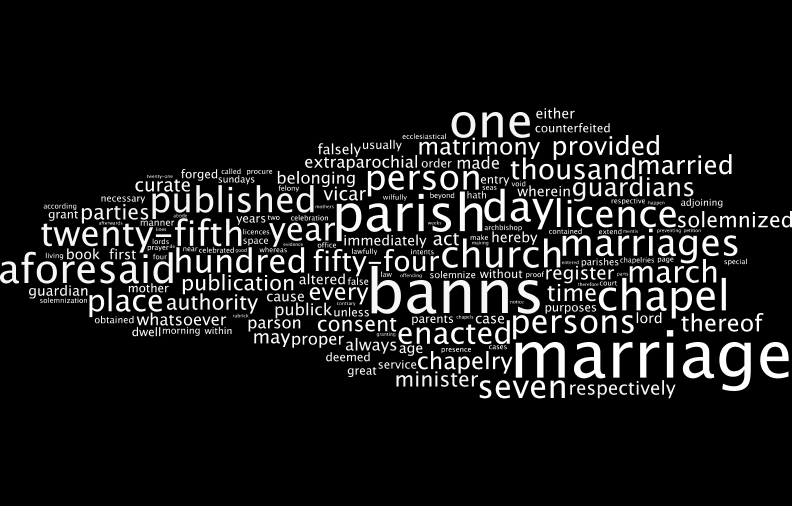 Provided always, and be it enacted by the Authority aforesaid, That no Parson, Minister, Vicar or Curate solemnizing Marriages after the twenty-fifth Day of March one thousand seven hundred and fifty-four, between Persons, both or one of whom shall be under the Age of twenty-one Years, after Banns published, shall be punishable by Ecclesiastical Censures for solemnizing such Marriages without Consent of Parents or Guardians, whose Consent is required by Law, unless such Parson, Minister, Vicar or Curate shall have Notice of the Dissent of such Parents or Guardians; and in case such Parents or Guardians, or one of them, shall openly and publickly declare, or cause to be declared in the Church or Chapel where the Banns shall be so published, at the Time of such Publication, his, her or their Dissent to such Marriages such Publication of Banns shall be absolutely void. IV. And it is hereby further enacted, That no Licence of Marriage shall, from and after the said twenty-fifth of March in the Year one thousand seven hundred and fifty-four, be granted by any Archbishop, Bishop, or other Ordinary or Person having Authority to grant such Licences, to solemnize any Marriage in any other Church or Chapel, than in the Parish Church or Publick Chapel of or belonging to the Parish or Chapelry, within which the usual Place of Abode of one of the Persons to be married shall have been for the Space of four Weeks immediately before the granting of such Licence; or where both or either of the Parties to be married shall dwell in any Extraparochial Place, having no Church or Chapel wherein Banns have been usually published, then in the Parish Church or Chapel belonging to some Parish or Chapelry adjoining to such Extraparochial Place, and in no other Place whatsoever. V. Provided always, and be it enacted by the Authority aforesaid, That all Parishes where there shall be no Parish Church or Chapel belonging thereto, or none wherein Divine Service shall be usually celebrated every Sunday, may be deemed Extraparochial Places for the Purposes of this Act, but not for any other Purpose. VI. Provided always, That nothing herein before contained shall be construed to extend to deprive the Archbishop of Canterbury and his Successors, and his and their proper Officers, of the Right which hath hitherto been used, in virtue of a certain Statute made in the twenty-fifth Year of the Reign of the late King Henry the Eighth, intituled. An Act concerning Peter Pence and Dispensations ; of granting Special Licences to marry at any convenient Time or Place. VII. Provided always, and be it enacted, That from and after the twenty-fifth Day of March in the Year one thousand seven hundred and fifty-four, no Surrogate deputed by any Ecclesiastical Judge, who hath Power to grant Licences of Marriage, all grant any such Licence before he hath taken an Oath before the said judge faithfully to execute his Office, according to Law, to the best of his Knowledge, and hath given Security by his Bond in the Sum of one hundred Pounds to the Bishop of the Diocese, for the due and faithful Execution of his said Office. VIII. And whereas many Persons do solemnize Matrimony in Prisons and other Places without Publication of Banns, or Licence of Marriage first had and obtained; Therefore, for the Prevention thereof, Be it enacted, That if any Person shall, from and after the said twenty-fifth Day of March in the Year one thousand seven hundred and fifty-four, solemnize Matrimony in any other Place than a Church or Publick Chapel, where Banns have been usually published, unless by Special Licence from the Archbishop of Canterbury; or shall solemnize Matrimony without Publication of Banns, unless Licence of Marriage be first had and obtained from same Person or Persons having Authority to grant the same, every Person knowingly and wilfully so offending, and being lawfully convicted thereof, shall be deemed and adjudged to be guilty of Felony, and shall be transported to some of his Majesty’s Plantations in America for the Space of fourteen Years, according to the Laws in Force for Transportation of Felons; and all Marriages solemnized from and after the twenty-fifth Day of March in the Year one thousand seven hundred and fifty-four, in any other Place than a Church or such Publick Chapel, unless by Special Licence as aforesaid, or that shall be solemnized with Publication of Banns, or Licence of Marriage from a Person or Persons having Authority to grant the same first had and obtained, shall be null and void to all Intents and Purposes whatsoever. IX. Provided, That all Prosecutions for such Felony shall be commenced within the Space of three Years after the Offence committed. X. Provided always, That after the Solemnization of any Marriage, under a Publication of Banns, it shall not be necessary in support of such Marriage, to give any Proof of the actual Dwelling of the Parties in the respective Parishes or Chapelries wherein the Banns of Matrimony were published; or where the marriage is by Licence, it shall not be necessary to give any Proof that the usual Place of Abode of one of the Parties, for the Space of four Weeks as aforesaid, was in the Parish or Chapelry where the Marriage was solemnized ; nor shall any Evidence in either of the said Cases be received to prove the contrary in any Suit touching the Validity of such Marriage. XII. And whereas it may happen, that the Guardian or Guardians, Mother or Mothers, of the Parties to be married, or one of them, so under Age as aforesaid, may be Non compos mentis, or may be in Parts beyond the Seas, or may be induced unreasonably, and by undue Motives to abuse the Trust reposed in him, her or them, by refusing or with-holding his, her or their Consent to a proper Marriage; Be it therefore enacted, That in case any such Guardian or Guardians, Mother or Mothers, or any of them, whose Consent is made necessary as aforesaid, shall be Non compos mentis, or in Parts beyond the Seas, or shall refuse or with-hold his, her or their Consent to the Marriage of any Person, it shall and may be lawful for any Person desirous of marrying, in any of the before-mentioned Cases, to apply by Petition to the Lord Chancellor Lord Keeper, or the Lords Commissioners of the Great Seal of Great Britain for the Time being who is and are hereby impowered to proceed upon such Petition, in a summary Way; and in case the Marriage proposed, shall upon Examination appear to be proper, the said Lord Chancellor, Lord Keeper, or the Lords Commissioners of the Great Seal for the Time being, shall judicially declare the same to be so by an Order of Court, and such Order shall be deemed and taken to be as good and effectual to all Intents and Purposes, as if the Guardian or Guardians, or Mother of the Person so petitioning, had consented to such Marriage. XIII. And it is hereby further enacted, That in no Case whatsoever shall any Suit or Proceeding be had in any Ecclesiastical Court, in order to compel a Celebration of any Marriage in facie Ecclesiæ, by reason of any contract of Matrimony whatsoever, whether per verba de præfinti, or per verba de futuro, which shall be entered into after the twenty-fifth Day of March in the Year one thousand seven hundred and fifty-four; any law or Usage to the contrary notwithstanding. XIV. And for preventing undue Entries and Abuses in Registers of Marriages; Be it enacted by the Authority aforesaid, That on or before the twenty-fifth Day of March in the Year one-thousand seven hundred and fifty-four, and from Time to Time afterwards as there shall be Occasion, the Church-wardens and Chapel-wardens of every Parish or Chapelry shall provide proper Books of Vellum, or good and durable Paper in which all Marriages and Banns of Marriage respectively, there published or solemnized, shall be registered, and every Page thereof shall be marked at the Top, with the Figure of the Number of every such Page, beginning at the second Leaf with Number-one; and every Leaf or Page so numbered, shall be ruled with Lines at proper and equal Distances from each other, or as near as may be; and all Banns and Marriages published or celebrated in any Church or Chapel, or within any such Parish or Chapelry, shall be respectively entered, registered, printed, or written upon or as near as conveniently may be to such ruled Line , and shall be signed by the Parson, Vicar, Minister or Curate, or by some other Person in his Presence and by his Direction; and such Entries shall be made as aforesaid, on or near such Lines in successive Order, where the Paper is not damaged or decayed, by Accident or Length of Time, until a new Book shall be thought proper or necessary to be provided for the same Purposes, and then the Directions aforesaid shall be observed in every such new Book; and all Books provided as aforesaid shall be deemed to belong to every such Parish or Chapel respectively, and shall be carefully kept and preserved for publick Use. This Marriage was solemnized between us A.B. C.D. in the Presence of E.F. G.H. XVI. And be it further enacted by the Authority aforesaid, That if any Person shall, from and after the twenty-fifth Day of March in the Year one thousand seven hundred and fifty-four, with Intent to elude the Force of this Act, knowingly and wilfully insert, or cause to be inserted in the Register Book of such Parish or Chapelry as aforesaid, any false Entry of any Matter or Thing relating to any Marriage; or falsely make, alter, forge or counterfeit, or cause or procure to be falsely made, altered, forged or counterfeited, or act or assist in falsely making, altering, forging or counterfeiting any such Entry in fsch Register; or falsely make, alter, forge or counterfeit, or cause or procure to be falsely made, altered, forged or counterfeited, or assist in falsely making, altering, forging or counterfeiting any such Licence of Marriage as aforesaid; or utter or publish as true any such false, altered, forged or counterfeited Register as aforesaid, or a Copy thereof, or any such false, altered, forged or counterfeited Licence of Marriage, knowing such Register or Licence of Marriage respectively, to be false, altered, forged or counterfeited ; or if any Person shall, from and after the said twenty-fifth Day of March, wilfully destroy, or cause or procure to be destroyed, any Register Book of Marriages, or any Part of such Register Book, with Intent to avoid any Marriage, or to subject any Person to any of the Penalties of this Act ; every Person so offending, and being thereof lawfully convicted, shall be deemed and adjudged to be guilty of Felony, and shall suffer Death as a Felon, without Benefit of Clergy. XVII. Provided always, That this Act, or any Thing therein contained, shall not extend to the Marriages of any of the Royal Family. XVIII. Provided likewise, That nothing in this Act contained shall extend to that Part of Great Britain called Scotland, nor to any Marriages amongst the People called Quakers, or amongst the Persons professing the Jewish Religion, where both the Parties to any such Marriage shall be of the People called Quakers, or Persons professing the Jewish Religion respectively, nor to any Marriages solemnized beyond the Seas. XIX. And be it further enacted by the Authority aforesaid, That this Act shall be publickly read in all Parish Churches and publick Chapels, by the Parson, Vicar, Minister or Curate of the respective Parishes or Chapelries, on some Sunday immediately after Morning Prayer, or immediately after Evening Prayer, if there shall be no Morning Service on that Day, in each of the Months of September, October, November and December, in the Year of our Lord one thousand seven hundred and fifty-three, and afterwards at the same Times, on four several Sundays in each Year, (that is to say,) The Sundays next before the twenty-fifth Day of March, twenty-fourth Day of June, twenty-ninth Day of September, and twenty-fifth Day of December respectively, for two Years, to be computed from and immediately after the first Day of January in the said Year one thousand seven hundred and fifty-four.